When Pope Francis leads Mass on Wednesday in Washington, D.C., he will speak not in English, but in his native Spanish. Leaders in the Catholic Church say the pope’s delivery in Spanish serves as a nod to the new saint he will canonize, Junipero Serra, a Spanish-American missionary who established a chain of missions in California during the late 1700s. While the pope is most comfortable speaking Spanish, the church’s Latino population in the U.S. is growing and now makes up one-third of the flock. Because Spanish is the most common language spoken by Americans except for English, the pope will find a large share of his parishioners able to understand his message. A majority of all Hispanic adults identify as Catholic and a large majority of Hispanic Catholics speak Spanish fluently, according to our 2013 National Survey of Latinos. Eight-in-ten Hispanic Catholics use mostly Spanish or are bilingual. In fact, they are more likely to be Spanish speakers than non-Catholic Hispanics (68%). One reason so many Hispanic Catholics speak Spanish is that two-thirds (65%) are foreign born. Nearly all Hispanic immigrants (95%) mainly use Spanish or are bilingual. 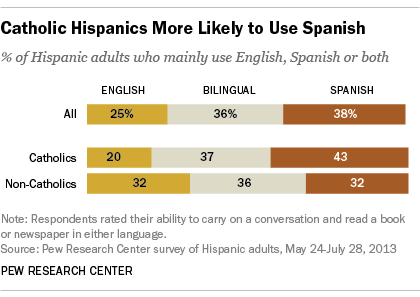 By comparison, about half as many U.S.-born Hispanics (44%) mainly use Spanish or are bilingual. The large number of immigrants in the U.S. from Mexico, a country with a strong Catholic tradition, contributes to the large presence of Hispanic immigrants within the church. Mexican immigrants make up 41% of U.S. Hispanic Catholic adults, while Mexican immigrants account for 34% of all Hispanic adults in the U.S. While Hispanic immigrants have helped make the U.S. Catholic Church bilingual, the share of Hispanic Catholics who only attend worship services in Spanish has declined in recent years. In 2013, 39% of Hispanic Catholic churchgoers said they attended worship services in Spanish every time, down from 60% in 2007.